Germania: Finalmente il nuovo governo? (A 100 giorni dalle elezioni). Non ancora, veramente, un nuovo governo. Ma ormai, tutto lascia sperare che la SPD in maggioranza appoggerà la tesi di Schulz per la condivisione del governo con la CDU/CSU (e quindi con la riconferma della "Cancelliera" Angela Merkel). Martin Schulz aveva assicurato il suo irrevocabile NO ad una riedizione della Große Koalition tra democristiani e socialisti (cioè CDU/CSU guidata ancora da Angela Merkel e SPD ora guidata da lui, l'ex presidente del PE). Ma ... sapete bene quanta poca stima ho sempre avuto io per questo individuo (secondo me piuttosto "losco", secondo me interessato davvero, dietro l'arrogante prosopopea del gran socialista e del grande europeista, unicamente al proprio tornaconto. Ed ecco che il nostro "galantuomo" alla fine ha cambiato idea! Naturalmente, con il ritiro dei liberali e quindi con l'impossibilità di un governo "democristiano" sostenuto da una maggioranza parlamentare, il brav'uomo ha posto delle condizioni quasi ricattatorie (pavoneggiandosi ovviamente a favore del mondo operaio, delle famiglie a basso reddito, dei richiedenti asilo politico e spacciandosi anche per super-federatista-europeo). Sembra che ora (da quando in Francia c'è Macron all'Eliseo) vada di moda dirsi europeisti- super! Da noi Renzi ha cambiato bandiera (ripudiando, senza però mai dirlo, le sue sparate anti europeiste di quando era il capo del governo (specialmente nell'ultimo anno, ed in vista del famigerato referendum di riforma costituzionale). Gentiloni ci tiene, prima di uscire di scena, ad esaltare la visita a Roma di Macron. Il quale l'estate scorsa, prima delle elezioni in Germania (24 settembre 2017) non si aspettava certo l'impasse delle difficoltà di formazione del governo tedesco. Averva detto ancora che entro dicembre (quando, secondo i le sue aspettative, il nuovo governo tedesco giàuscito dal rodaggio) si aspettava una reazione costruttiva da parte tedesca alle sue 10 proposte di riforma dell'UE (e soprattutto dell'Eurozona). Siamo già a gennaio e solo adesso parte il governo tedesco. Ma (almeno a parole) parte col proposito di caratterizzare la politica tedesca col rilancio della politica europea. Boh! C'è di mezzo Schulz e quindi, secondo me, tutto è possibile, anche il contrario di quanto ora si prospetta. Segnalo (e trascrivo) un paio di articoli a riguardo delle nuove aspettative pro-europee del nuovo governo Merkel-Schulz. Il primo viene da Financial Times di oggi (domenica 14 gennaio 2017) a firma di Wolgang München. Il secondo, (pubblicato venerdì 12 gennaio 2017, ma ricevuto da me via news-letter ieri sabato 14.01.2017), viene dal solito EUobserver.com. Germany’s two main parties finally reached a preliminary agreement for a grand coalition. Whether it holds is anyone’s guess. There are plenty of obstacles still in the way between the deal reached in the early hours of Friday morning and Germany getting a new government. But if the parties involved — the Christian Democrats led by chancellor Angela Merkel and the Social Democrats — do manage to pull it off, it would be truly radical in one respect: the section on the future of the EU lays out the biggest push by Germany towards continental integration since the Maastricht treaty a quarter of a century ago. In the last grand coalition deal, in 2013, there was hardly any reference of Europe beyond the usual clichés. The big issue then was the national minimum wage. But in last week’s agreement, Europe is the number one item. This section goes way beyond a general willingness to engage with the French president Emmanuel Macron on eurozone reform. It declares a readiness to expand the EU budget with a larger German net contribution. It specifically supports a eurozone budget to fund macroeconomic stabilisation, social convergence and structural reforms. The way I read this is that the European Stability Mechanism, the rescue umbrella, would be part of an enlarged EU budget and not, as now, run by member states. This is exactly what Jean-Claude Juncker, European Commission president, demanded. He must be delighted. It marks a momentous shift away from the inter-governmentalism of Ms Merkel towards a more integrationist position. I just wonder what the conservatives in the CDU and their Bavarian allies, the Christian Social Union, make of the chancellor’s latest U-turn. On the ESM, we knew that Germany wanted to expand it, but we did not know that it now wants it to be anchored inside the EU. Wolfgang Schäuble, the previous finance minister, was adamant that the ESM should not come under the wings of the commission. That position, too, seems to have changed. The preliminary agreement also envisages strengthening the European Parliament to make the governance of the eurozone more democratic. On this point the German parties disagree with Mr Macron, who wants a separate eurozone parliament. Where Germany does support France is with an explicit call to strengthen anti-dumping policies and to impose a minimum corporate tax rate across the EU. Watch out for a big confrontation between France and Germany on one side and low tax member states such as Ireland on the other. The first pages of the agreement make welcome reading to those of us who have advocated more measures to make the eurozone less crisis-prone. The preliminary agreement also envisages strengthening the European Parliament to make the governance of the eurozone more democratic The section on Europe clearly reveals the hand of Martin Schulz, SPD leader and a former president of the European Parliament. But how will this go down with your average SPD party activist? Does their enthusiasm about European integration outweigh their hostility towards Ms Merkel? The SPD rank and file are hostile to the chancellor’s leadership style and are infuriated by her tendency to adopt their policies and make them her own. 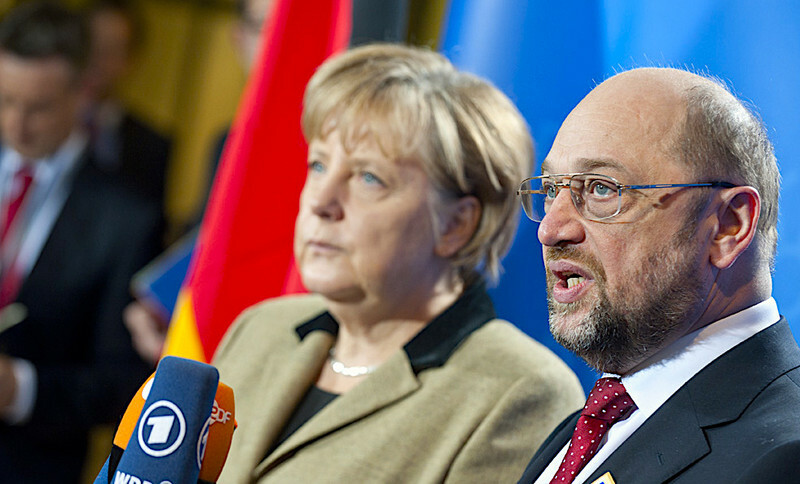 The consensus view within the SPD is that the relationship cost them the election. Many, including the SPD’s youth organisation, want a period in opposition to regenerate. I am no fan of grand coalitions, which end up strengthening extremist parties. Moreover, a new coalition would not be grand. It would have 56 per cent of the seats in the Bundestag, down from about 80 per cent last time. A new grand coalition might well be the last of its kind. Germany could become like the Netherlands, where it takes four or five parties to form a government. Is this a price worth paying for a European agenda with an uncertain outcome? There is no guarantee that a joint Franco-German proposal for the eurozone would be accepted by all EU members. It would require formal treaty change, which itself must be agreed by all member states. France and Germany may start off with a coalition of the willing, and take it from there. The coalition deal made by the recently formed Dutch government names the exact opposite objective: no further strengthening of the eurozone. Can France and Germany really proceed without the Netherlands? Will the Netherlands change its views if Germany does? What is certain is that it will be tough going all the way. Tough to get the SPD’s party congress on January 21 to back formal coalition talks. Tough to get SPD members to approve a coalition agreement. And even tougher to get all 19 eurozone members to agree reforms. Perhaps the most remarkable part about Friday’s document is that it signals a shift from Ms Merkel’s non-committal managerial style to more agenda-driven politics. We are approaching a new era. 2 –––> Il governo tedesco di coalizione punta sul rinnovo dell'UE di tipo ... "Macron-lite"
German chancellor Angela Merkel's conservative Christian Democrats (CDU) and its Bavarian allies (CSU) struck a preliminary deal with the centre-left Social Democrats (SPD) on Friday (12 January) to open formal coalition talks. On Europe, the agreement aims to kickstart the Franco-German tandem driving EU policies and integration by welcoming France's president Emmanuel Macron's reform ideas. "The renewal of the EU will only succeed if Germany and France work together with all their strength. That is why we want to further strengthen and renew German-French cooperation," the 28-page text , agreed after 24 hours of marathon talks, said. The actual election was in September, whilst an initial potential coalition of conservatives, liberals and greens - the 'Jamaica' option - fell apart during talks late last year. While the agreement remains mute on details, it is clear Germany is not ready to loosen its grip on the continent's prudent fiscal policies. It pledges to support the strengthening of the eurozone by supporting the idea of a future "investment budget" for the single currency bloc. This falls short of backing Macron's proposed eurozone budget, but supports specific budgetary resources for economic stabilisation, social convergence and for structural reforms in the eurozone. This could be the starting point for the "investment budget". The three German parties also support turning the eurozone emergency fund, the European Stability Mechanism (ESM) into a full-blown European Monetary Fund under parliamentary control and anchored in EU law. This would turn the fund into a European institution rather than an intergovernmental body. "In this spirit, and especially in close partnership with France, we want to sustainably strengthen and reform the eurozone so that the euro can better withstand global crises," the agreement stated. The CDU/CSU and the SDP have agreed to limit the number of asylum seekers coming into Germany to between 180,000 and 220,000 per year. In another victory for the CSU – which has pushed for tougher asylum policy – a maximum of 1,000 people per month would be allowed to join their families already living in Germany. Germany would also boost its contribution to the EU budget – as all member states will have to, as the UK will leave a hole in the budget after it leaves the bloc. The deal makes no mention of Brexit itself, however. The parties are also backing fighting tax fraud and tax evasion, supporting taxing companies where they make their profits, especially concerning tech giants such as Google, Apple, Facebook and Amazon. "In the future, companies must no longer be able to escape their social responsibility by playing off the EU states against each other," the preliminary agreement said. To avoid social dumping, a key issue for both France and Germany, the deal sets out to propose minimum wage regulations and basic social security systems across the EU. The deal also hints at the possibility of linking the EU budget to political conditions, when it states that reciprocal solidarity must also count for the EU budget. This could be a warning to Hungary and Poland, which have not taken in any refugees despite an EU decision to do so. Merkel last September warned that those rejecting "solidarity", a code word for taking in refugees under the EU scheme, could lose EU funds. "We want to deepen the cohesion of Europe based on its democratic and constitutional values ​​at all levels and strengthen the principle of mutual solidarity," the text stated. "The democratic and constitutional values ​​and principles on which European unity rests must be enforced even more consistently than hitherto within the EU," the deal adds, in a reference to rule of law and democracy concerns with Hungary and Poland. The German parties also point out that with changing policies in the US, the rise of China and growing Russian influence in Europe, "Europe must take its fate more than before in their own hands". The deal said Germany continues to believe in free and fair trade, while rejecting "protectionism, isolationism and nationalism", in a reference to US president Donald Trump's "America First" policy. Macron was elected last May promising to overhaul the EU. Only two days after the German elections in September , he called for a a eurozone budget. Merkel said at last month's EU summit that she would develop joint positions on Europe with Macron by March. Merkel passed this first hurdle of the – by German standards unusually long – coalition talks by reaching a preliminary agreement with the SPD. This comes as a relief to Merkel, who could have faced fresh elections had the coalition talks collapsed. The task now is to convince the SPD's rank and file to sign up for the deal and the grand coalition with Merkel's Christian Democrats. The SPD entered talks with Merkel reluctantly, as after four years of governing with the CDU, the Social Democrats suffered a bruising election last September, falling to their worst results since the second world war. Party leader Martin Schulz initially said the Social Democrats would not enter another grand coalition, partly to avoid leaving the far-right Alternative for Germany (AfD) – which came in third at the polls – as the main opposition party. SPD members were irked by the prospect of spending another four years in Merkel's shadow as voters punished mainstream parties at the September ballot. However, as CDU/CSU's coalition negotiations with the Greens and the Free Democrats collapsed, Schulz saw an opportunity to push his pro-Europe, social agenda through. A coalition agreement would need a green light from the SPD at a special conference on 21 January in Bonn, and needs ratification by the SPD's 400,000 members by post. Formal coalition talks on the basis of the agreed text that could begin later this month if the SPD's congress gives the go-ahead and be concluded by March. European Commisison president Jean-Claude Juncker welcomed "a significant, positive, constructive, forward-looking contribution to the European policy debate." "In terms of the substance, I'm very happy with what the CDU, CSU and SPD have agreed as party of a common policy for the future [of the EU]," he told journalists in Sofia. Speaking with Juncker, Bulgarian prime minister Boyko Borisov, whose country is taking over the presidency of the EU Council, noted that "Germany's stability impacts all of the EU". Referring to the discussions on a post-2020 EU budget that will start at spring, he noted that "the largest amount of money is expected from Germany." "We all hope that this [coaltion forming] process will come on an end soon, because it will be for the benefit of all." The prospect of a German government being in place in the coming weeks is "a big news, a good news," an EU source said, adding that "finally"' the EU will start to discuss again on the main issues. While details are still to be agreed during the negotiations for a final coalition agreement, the official said that the main lines of the future German government were "compatible" with what the commission has proposed in recent months.